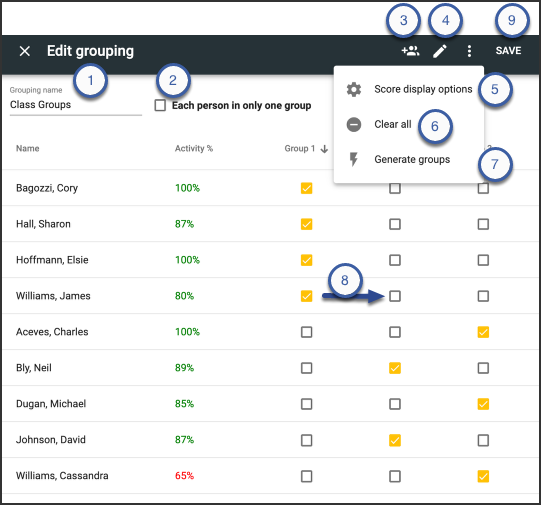 Use Buzz’s Manage Groups feature to remove the guesswork from directing group work. A teacher can group the same class in various ways to meet different needs. Each different grouping is called a Grouping. You can use groups to connect students according to performance, send group messages, assign group activities, create quick group intervention tasks, assign group grades, award group badges, and filter your list views with them. Select the desired course from the Main Menu. Open the People tool for that course. Click Tools in the toolbar and select Manage groupings. Select the Grouping you want to edit. Click the Copy grouping button next to a grouping you want to duplicate. Click the Delete grouping button next to a grouping you want to eliminate. Click Add grouping to create a new grouping. Choose to limit each person to membership in one group. Add Groups to the grouping. Click the pencil icon (edit) to change group names or delete groups from the grouping. 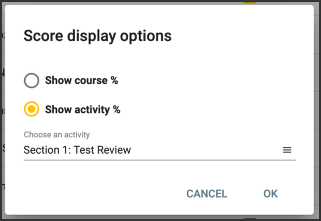 Select Show course % to use overall performance. Select Show activity % and choose the desired course in the dropdown that appears next to it to use performance on a specific activity. Clear All students from the assigned groups. Automatically Generate Groups (Step 5). Move students between groups by clicking the cell that aligns with the student and the group you want to place them in. Click Tools in the toolbar and select Manage groups. Enter a Group prefix; each group that is generated uses this prefix and a number to indicate that they’re part of this Group Set. Choose your Group creation method. If you choose Fixed number of groups, you need to specify the number of groups. If you choose Target number of students per group, you need to specify the number of students per group. Round Robin assigns the first student in the list to the first group, the second student to the second group, and so on. If there are only three groups, the fourth student is assigned to the first group, the fifth student to the second, and so on. Homogeneous by performance groups students with those who have the most similar scores (Learn more). Heterogeneous by performance evenly distributes performance, so groups end up with a balanced range of scores (Learn more). Heterogeneous by performance - Top/Bottom groups the highest-scoring students with the lowest-scoring, then the next highest with the next lowest, and so on (Learn more). Heterogeneous by performance - 1st Q/3rd Q; 2nd Q/4th Q groups highest-scoring students with next-to-lowest-scoring students, then next-to-highest-scoring students with the next lowest-scoring, and so on (Learn more). Show course % to use overall performance. Show activity % to use performance on a specific activity. This options requires you to select the desired activity in the dropdown that appears. Open Score display options from the vertical menu in the toolbar. Select the desired radio button and click OK.
Click Generate groups and follow steps 5-8, above using one of the "by performance" options in the Group assignment dropdown (step 7). You can also create and manage groups when setting up group assignments in Editor tool. Do groups all have to be enrolled in the same course? I run a credit recovery program, and several classes were all the students are enrolled in different courses. How can I group these so I can see just 1 class at a time? Groups are limited to users in the same course, there is not currently a way to group students together outside of the same course. 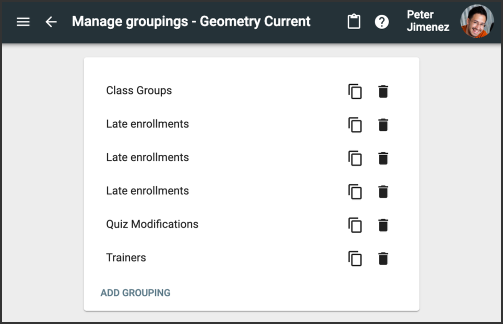 A Feedback/Suggestion: When we enroll the students in to a course, we have to set them up into groups (click on "Generate Groups") after the enrollments. If there is a way to automatically put them into groups/Generate groups, it would be very helpful. May be give an option of the groups when enrolling them into the course? or Auto generate groups after each enrollment? Would this be possible? This functionality isn't currently available. We will flag your feedback for inclusion in further discussion on continuous improvements to Buzz. Just to jump in, I would also love the functionality that Juanita suggested. I would like some clarification please. I currently have the group setting: Each person in only one group. Are there any limitations for this setting? One of my new students got allocated to a group that belonged to a "Withdrawn" student and now the new student is able to view all the messages of the "Withdrawn" student. How would that happen? If a student got allocated to group 1, should no other student be ever assigned to that group again? From the information provided it sounds like the best option would be to manually add a new group to the group set so that the new student would be able to have a unique group. 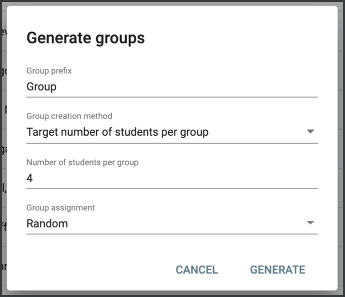 The option to have each person in only one group is used when generating groups to determine how many groups need to be created with the number of student enrollments in the course at the time the groups are generated. If a new user is added then the number of groups would need to be increased to match. Group members are designed to be able to see the collaborative items (discussion boards, journals, peer activities) of other group members. 1) How to create/remove groups within the new UI? 2) How to add/remove students from a group in the new UI? 3) How to manage what is included/excluded within each group in the new UI? I have spent quite a bit of time trying to figure this out.... I am sure it is something simple. Any help would be appreciated. You may remove or move students from groups by selecting the cell under the group and student. To manage what's included in a group is defined within the item settings. See our document: How do I configure group-specific activity settings? Are students able to view which group they're in? Are they able to see other students in that group? If so, is there a way to keep it confidential where they are only grouped for teacher purposes and make students unable to see their grouping? Students at our school are unaware that groups in Buzz exist. That may, however, be a local setting. I'm sure that someone from Agilix can pipe in to confirm. Students do not see their group name or members of other groups they are not part of. However, group members are designed to be able to see the collaborative items (discussion boards, journals, peer activities) of other members in their own group.